In December 2017, engineering business of Uflex demonstrated its semi-automatic co-extrusion lamination machine at an Open House at its premises in Noida. 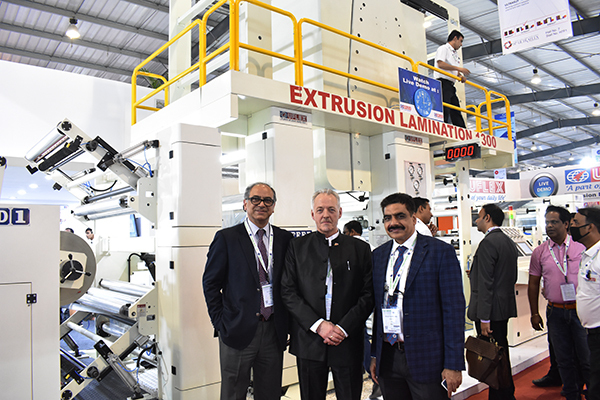 Almost two months later at Plastindia 2018 exhibition, it launched its fully automatic co-extrusion lamination machine. “While the semi-automatic co-extrusion lamination machine displayed at the Open House had speeds up to 250 meters/minute, the fully automatic machine runs at speeds up to 300 meters/minute. Progressively, depending on customers’ requirements, we would like to graduate to speeds up to 350 meters/minute and then 400 meters/minute,” said Ajay Tandon, president and chief executive officer, engineering business at Uflex Limited. The fully automatic co-extrusion laminator offers a maximum web width of 1300 mm (in LDPE) and can process LDPE, EVA, EAA and PP. Equipped with turret type unwinders and rewinders with auto-splicing, it has 3-layer feed-block with variable geometry. Auto-splicing is available at all stations with maximum speed. It has a specially designed primer coating station for giving anchor coat better bond strength. The machine is also equipped with hydraulic screen changer to increase uptime and has an imported automatic T-die for easy clean-up. The fully automatic machine employs a computerized auto gauge control system to read and correct the coating thickness automatically, if required. Uflex has more than 15 extrusion lamination machines running at its different converting plants, all imported from various parts of the world. “Now we are manufacturing our own extrusion laminators,” said Tandon. “We had launched the first extrusion lamination machine for laminating Woven Poly Propylene (WPP) to OPP film about two years ago. That machine was installed at our own plant. After successfully running the machine and eliminating snags, we took up the project in commercial direction, and started making these machines about a year-and-a-half ago for coating and/or laminating different plastic films”. In a recent development, Uflex has roped in Uwe Fidersek as advisor – global extrusion coating technology, Uflex. Fidersek has over 40 years of hands-on experience in design & production, installation, commissioning and providing customer service on extrusion lamination machine with one of the best companies of the world located in Germany. Fidersek will provide his expertise to Uflex in manufacturing state-of-the-art extrusion lamination machines to be sold in India and world over in the times to come. The extrusion lamination process is becoming more and more popular in India since last 6 to 8 years. However, Uflex started it almost 20 years ago, though it was at a much smaller scale at that time, according to Tandon. In last about 10 years, it has picked up due to various advantages that it provides. “There are a lot of advantages in using this particular kind of a lamination process over adhesive lamination,” said Tandon. Extrusion lamination offers benefits such as: alleviation of solvents/compounds used in adhesives; ruling out white base ink-printing of the ensuing laminate by using master-batch in the extrudate that renders it white thereby bringing immense cost savings to the converter; enhanced bond strength; consistent/continuous production of laminate owing to auto-splicing feature of the extrusion laminator; no curing required as in the case of adhesive lamination thereby enhancing production throughput and better strength and barrier properties as compared to adhesive lamination. LDPE is especially suitable for use in the extrusion coating process and is applied to a wide variety of substrates. A major application is in the coating of board for milk and fruit juice cartons, as an LDPE/board/LDPE or LDPE/board/LDPE/aluminium foil/LDPE laminate (the latter for aseptic packaging). Other applications include specialized laminates for liquid and food packaging, and industrial and building uses. The polyethylene coating provides increased tear resistance, scuff resistance, a heat sealable surface, resistance against chemicals, grease resistance, and a good barrier against water and various gases. What is Extrusion Coating and Extrusion Lamination? Extrusion coating is one of the processes used to produce a large range of thin multilayer structures. In the extrusion coating of polyethylene, a molten web of extruded polymer is applied as a thin coating onto a substrate which is passing continuously through a nip-roll assembly. In extrusion lamination, the molten polymer is applied as an adhesive layer between two substrates to form a laminated structure. The substrate may be paper, paper board, polyester film, polypropylene film, aluminum foil, woven fabric, etc.